Just because your hair is thinning doesn’t mean you should panic. True, it’s an early sign of the slow process leading to baldness, but there’s no reason to cause greater hair loss by overly-stressing about it. Besides, there are plenty of products to treat thinning hair, including Ultrax Labs Hair Surge . We’ll review 11 such products in this post while also looking at ways in which you can style hair to make it look thicker. So, relax gentlemen. Not all hope is lost, if your hair has started to thin. If you’re in the market for products that will treat your thinning hair effectively, it’s always important to have a plan of attack before you shop. Keep the following tips in mind as you peruse the many products available for treating thin hair. Always read the product’s ingredients carefully before you buy. We always favor those that have all-natural ingredients, such as essential oils, vitamins, herbal compounds, and aloe vera. They’re easier on your hair – meaning they’ll cause less damage – and can help make your hair look its best. Whenever possible, avoid products that include harsh ingredients, such as parabens, silicones, and alcohol. Parabens and other preservatives can damage hair and accelerate hair loss, as will sulfates, silicones, and other chemicals. Products that contain silicone may cause product build-up, which can make hair fragile and more prone to breakage, while products used to treat thin hair that contain alcohol may cause hair to become overly dry. 2. Is it thin or fine? Many hair experts say that an important first step – before you even begin shopping for thinning hair products – is to determine whether your hair is thin or fine. While it’s true that thin and fine hair are very similar – and the terms often are used interchangeably – there are differences. Here’s the main difference: while fine hair is small in size, it’s often fairly plentiful. Thin hair tends to be a bit thicker, but fewer in number. You can do a self-check for fine hair by taking a strand of your hair and rubbing it between your index finger and thumb. If you can’t feel the hair, or can barely feel it, then you likely have thin hair. Does it matter all that much whether you have fine or thin hair when you’re shopping for products to treat your hair’s overall thinness? Not so much, but it’s always important to shop for shampoos, conditioners, etc. designed for your specific needs. While it may seem overly obvious to suggest that you should look for products that add volume to thinning hair, it’s still worth emphasizing. Volumizing products lift hair at the follicle and separate individual hair strands while adding density. Avoid greasy products or any that clump hair together. Even if you have dry hair, you also need to be careful when choosing moisturizing shampoos, because they can clog your scalp’s pores and hinder new growth. This point takes us back to #1 above (the ingredients). Look for ingredients – vitamins, for one – that nourish and fortify hair and protect your follicles from further damage. Many men use conditioners in addition to shampoo, including men with thinning or fine hair. Choose conditioners without harsh chemicals, and also be wary of “heavy” conditioners that can weigh down your thinning hair. Leave-in conditioners may fall into the latter category, so choose wisely, but lightweight leave-in sprays work well. Many men also use hair-styling products, such as pastes and pomades. While men with thin hair should have no qualms about using pastes and pomades, they’re best-served by those with water-based formulas that rinse out easily and won’t cause excessive build-up on hair. Be wary of using hair wax, however, because it often adds too much weight to hair and may tear out brittle hair during its application. Next, let’s look at our list of the best men’s hair products for thin hair. Some would argue that caffeine is more important than life itself. OK, so maybe they wouldn’t go that far, but the stuff that gives coffee its kick is an essential part of many lives. Caffeine takes on even more value when you consider that it’s a vital ingredient in many shampoos and other products used to treat thinning hair. Caffeine is a stimulant – no surprise there – and it stimulates the life cycle of hair follicles while encouraging healthy hair growth when applied to the scalp. It’s also one of the reasons for the effectiveness of the Ultrax Labs Hair Loss/Hair Growth Stimulating Shampoo. Few reviews of shampoos used to treat thinning hair don’t include Hair Surge, which has over 6,000 reviews on Amazon – with the majority of them dishing out high marks. Ultrax Labs markets Hair Surge as having a one-of-a-kind formula that does exactly what it says it’s going to do: promote hair growth. It’s a formula that also includes Ketoconazole, saw palmetto, peppermint oil, and menthol. You’ll find Ketoconazole in plenty of over-the-counter shampoos. It helps keep the hair and scalp healthy by blocking fungus and inhibiting the enzyme 5-alpha-reductase. The latter is responsible for the production of dihydrotestosterone (DHT), a hormone believed to be responsible for hair loss in individuals with androgenetic alopecia (a.k.a. male pattern baldness). Saw palmetto also inhibits 5-alpha-reductase production when applied topically. Be careful when taking it internally, however, because it may cause certain parts of the male anatomy to remain flaccid, if you know what we mean. Peppermint oil is also helpful for stimulating hair growth, while menthol is an organic compound with anti-inflammatory and analgesic properties. Hair Surge does contain Sodium Laureth Sulfate (SLES), which sounds a bit too chemical to be 100% safe, but unlike Sodium Lauryl Sulfate (SLS) it goes through an extra step in manufacturing that reduces the risk of irritation. You can – and should – use Hair Surge five days a week to get the best results. Ultrax recommends applying it evenly over wet hair and then vigorously massaging it into your hair and scalp. Leave it on for a few minutes before rinsing it off. Many men attest to the virtues of Ultrax Labs Hair Surge shampoo, appreciating how it enhances new hair growth while treating thinning hair. Its unique blend of ingredients delivers positive results. New products come and go; technology evolves, research gets deeper – and, still, Rogaine remains right where it was over 30 years ago. That is, it’s one of the best products for hair loss and thinning hair in men and has the distinction of being the first topical hair regrowth brand approved by the FDA. To say many men have experienced positive results through using Rogaine is an understatement, and it’s certainly a product you should consider as you seek solutions to your thinning hair. The unscented foam solution entered the marketplace in 2006, and many competitors have developed products that try to capture the Rogaine magic. Minoxidil belongs to a class of drugs called vasodilators and was created many moons ago to help treat high blood pressure. One of its pleasant side effects was that it spurred new hair growth, and the rest, as they say, is history. Today, you’ll find it in a multitude of men’s hair products. 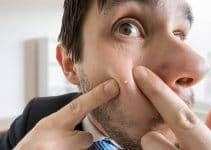 As a side note: women need to be wary of “unwanted” hair growth – such as sideburns – when using Minoxidil, which is why they should use Minoxidil only once a day (men are instructed to use it twice daily). By dilating blood vessels, Minoxidil stimulates blood circulation to the scalp to improve and restart hair growth. Rogaine is said to grow 25% more hair than other regrowth products and has a couple of clinical trials to back those claims. The Rogaine 5% foam (the 5% represents how much Minoxidil is in the product) includes Tricho-Prime Technology that’s said to work on contact while penetrating deeply into the scalp to create healthier, thriving hair. The Minoxidil foam also contains botanical extracts and emollients that help users maintain a healthy, well-conditioned scalp, as well as alpha hydroxy acid (AHA) that helps hair follicles remain open while also promoting natural skin exfoliation (the removal of dead skin cells) from the scalp. So that you know, you may not experience hair growth or noticeable results for several weeks and may experience continued hair loss for another couple of weeks. Why? Because thinner hairs shed to make room for thicker hair to grow in their place. So, be patient and wait for Rogaine to do what’s it’s supposed to do. If you’re not satisfied within 120 days of daily use, Rogaine offers a full money-back refund. Rogaine’s 5% Minoxidil foam is a good option for any man hoping to add volume to thinning hair while creating new growth. You may not notice results immediately, but the chances are good that you’ll notice them eventually. If you suffer from dandruff, you may have an even bigger problem than those unsightly white flakes falling like snow on your shoulders and clothes. If left untreated, dandruff also can lead to hair loss, because it’s a clear sign of an unhealthy environment on your scalp – particularly one that’s rife with fungus. 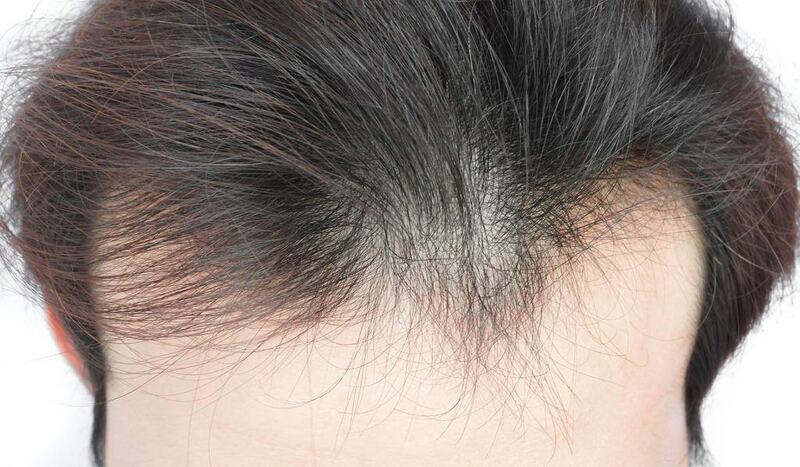 Moreover, the frequent itching caused by dandruff also may contribute to hair loss. Damn, if dandruff wasn’t bad enough already. But that’s why the one-two punch provided by Nizoral’s Anti-Dandruff Shampoo is an excellent solution for resolving thinning hair. It’s not only a powerful dandruff fighter, it also contains Ketoconazole. The latter has antifungal and antibacterial qualities that help slow hair loss while creating a thicker head of hair. Nizoral A-D keeps the scalp healthy and reduces the impact of a fungus called P. ovale, which is found on every scalp but impacts individuals differently. For some, the fungus leads to flaking, irritation, and scaling that can damage hair follicles and lead to hair loss. Make no mistake: Nizoral is strong stuff – so strong that you only need to use it twice a week to reap its full benefits. It’s also gentle enough to use on chemically-processed or color-treated hair and even on gray hair. Nizoral A-D produces a thick, rich lather that thoroughly cleans the hair and scalp and has a fresh scent. It won’t leave your hair feeling dirty, greasy, or oily. For best results, massage Nizoral A-D into your scalp deeply and then let it sit for several minutes before rinsing it off. Again, you only have to use it twice a week to notice a difference in both your dandruff and your thinning hair. Nizoral comes in three sizes – 4, 7, and 14 ounces – and offers a money-back guarantee if you return it within 8 weeks of your purchase. What’s not to like about a shampoo that treats dandruff while also helping to create thicker, fuller hair? Nizoral A-D’s one-two punch is hard to beat. Lipogaine is another brand that pops up frequently in searches of the best hair growth shampoos. It’s been around a while, for one, but also has a long, admirable history of delivering results where it counts: on the hair and scalp. It also contains a long list of natural ingredients, which is always a good thing, that supports healthy hair and nourish hair follicles. What it doesn’t contain is toxic substances, such as sulfates, parabens, and phthalates. Lipogaine also manufactures a wide assortment of hair care products, including its Lipogaine 5 and Lipogaine 3 shampoos. While the two shampoos have an abundance of similarities, as you might expect, they differ regarding their ingredients. Lipogaine’s Big 5 blends five (hence the name) ingredients that help add volume to thin hair: caffeine, biotin, argan oil, castor oil, and saw palmetto. Biotin, otherwise known as vitamin B7, is an ingredient found in many hair loss shampoos because of the link between biotin and zinc deficiencies with hair loss. Castor oil has multiple purposes, including that it fights fungus and bacteria which can disrupt healthy hair growth. Argan oil also promotes new hair growth while fighting fungus. Lipogaine’s blend of five powerful hair-healthy ingredients has the overall effect of fighting DHT, the hormone that’s essential for the formation of many male biological characteristics (deeper voice, muscle growth, etc.) but that can block the vitamins and minerals needed to nourish hair follicles. It also causes scalp inflammation, which makes hair weaker and more prone to thinning and falling out. And, lest we forget, Lipogaine contains 5% Minoxidil, that remarkable over-the-counter medication for hair loss. Lipogaine’s Big 5 reduces DHT levels while stimulating hair growth by increasing blood circulation to the scalp, which means, hair follicles get the proper amount of nutrients they need to thrive. Another thing we like about Lipogaine Big 5 is that its blend of premium organic ingredients is gentle enough for use by men (and women) with sensitive scalps that are prone to irritation. The Lipogaine Big 5 blend of hair-enhancing ingredients is hard to beat, and you’ll appreciate how it gives you a thicker head of hair without irritating the scalp. Toppik’s Hair Building Fibers falls under the subheading of hair concealers, which means they don’t generate new hair growth but give the appearance of a thicker, fuller head of hair. Many men use fibers to fill in the thin spots on their scalp and, given the realistic-looking results many fibers provide, you can’t blame them. One of the advantages of hair fibers is that you get instant results. There’s no waiting for hair to grow (because, again, they don’t regrow hair), and you can walk out the door immediately after applying them with the confidence that you’ve transformed your thinning locks. Toppik’s wool fibers consist of natural, colored Keratin protein that’s statically charged to intertwine with your existing hair. Keratin is the structural building block of hair, also found in the skin and nails. Many hair products, not just concealers, include keratin in their formulas to make hair look healthier. Toppik charges their fibers with static electricity to bond with the negative charge of hair. This action binds the hair fibers to existing hair follicles thereby creating the appearance of thicker hair. The bond is strong enough to resist wind, rain, and perspiration, but Toppik’s fibers are easy to wash off with water and your favorite shampoo. Another nice thing about Toppik’s Hair Building Fibers is that they won’t rub off on your clothes or pillow. Toppik’s Hair Fibers come in nine shades to make it easier to match your hair color. You can custom mix them to get as close to your natural shade as possible. The folks at Toppik recommend that you apply their fibers after you’ve applied your favorite styling products – such as gels and paste – and after you’ve used styling tools, such as a hairdryer. There’s plenty to like about Toppik’s Hair Building Fibers, including how easy it is to match them with your existing hair color. They also bond tightly with hair to create the look of a thicker, fuller hair. Once considered something of a “fringe” entry in the list of hair products, clay is now the go-to option for many men striving to improve the look of their hair. It’s also one of the better hair styling products for thin hair. Hair clays have thickening properties and will coat and separate individual hairs to create a more full-bodied look that men with thin hair desire. It also has restorative and therapeutic qualities that improve overall hair health. It works to thicken and texturize hair, thanks to its water-soluble mixture of clay, wax, and elastic fibers that also separate and define hair. It allows you to mold strands easily into your preferred hairstyle. It leaves a natural feel – one that’s touchable and not stiff and crunchy. It features a non-greasy blend of ingredients that leave a shine-free matte finish. It has a unique scent – “Sweet Tobacco” – that leaves a lasting impression. It’s mellow – but not so mellow that others won’t notice it – and decidedly masculine. Its non-sticky and easy to wash out at the end of the day. Its blend of ingredients is paraben-free. It works great on short to medium-length hair without being too heavy. Another nice thing about Man Made’s Hair Clay Pomade is that a little of it goes a long way. Simply scoop out a small amount of it, work it between your fingers, and then distribute it evenly through your damp or dry hair. You can use your comb, brush, or fingers to style your hair into its desired shape. If you don’t have hair clay in your grooming arsenal, you’re missing out on many benefits. Man Made’s Hair Clay enables you to achieve the hairstyle you want while helping to give you a thicker, fuller head of hair. Another excellent product from Lipogaine is its Intensive Treatment For Thinning Hair. It offers everything you’d expect from Lipogaine, namely a unique blend of ingredients that help deliver proven results. Moreover, like most Lipogaine products, it has plenty of well-deserved positive reviews. What’s in it? Well, again, what you’d expect from Lipogaine, including Minoxidil – the big hitter that many consider the best compound for hair growth anywhere. It also contains biotin, the powerful hair growth vitamin (B7). While its DHT-blocking herbal blend – Lipogaine’s secret formula, so to speak – protects the scalp from the negative effects of DHT. In short, your hair follicles won’t shrink and die off but will thrive and keep your scalp from thinning out. Lipogaine recommends using its products every day – if not twice a day – while applying 1 ml of the product to an area of the scalp where hair is thinning. It comes with a dropper that enables you to measure the right amount per application. Lipogaine’s Intensive Treatment for Thinning Hair offers strong medicine for hair follicles that look and feel thin. Its blend of Minoxidil and natural ingredients is hard to beat. OK, fellas, this is a unisex spray that many women use. Get over it. If you’re serious about adding volume and thickness to your hair, you deserve to try Nioxin’s 3D Thickening Style Spray. For one, Nioxin specializes in products formulated for use on thinning and fine hair. They’re products that strengthen thin hair, regrow hair, and make fine hair appear thicker. For what more could a man ask? The 3D Thickening Style Spray takes advantage of Nioxin’s ProThick Technology that coats individual hair strands to deliver immediate results, i.e. thicker hair. It works by adding texture while boosting hair from the roots to the ends. It leaves a slightly shiny finish, and it won’t weigh your hair down or leave it stiff and crunchy. You’ll also appreciate that the Nioxin Thickening Spray formula strengthens thin and fine hair without damaging strands, like you find with many other sprays. It’s ideal for longer hairstyles and provides a firm hold, although it’s suitable for medium-length to shorter styles, too. All you need to do is to spray it evenly on clean, damp hair and then comb it through for even distribution. You can then blow dry your hair to style it and to create extra volume. The Thickening Spray has a fresh, clean scent thanks, in part, to peppermint and wild leaf oils, but it’s not so minty fresh that it trods all over your masculinity. Nioxin’s Thickening Spray offers the kind of firm hold you’d expect from a hair spray while also helping to thicken hair. Why not get the volume you desire? Like Toppik’s Hair Building Fibers, DermMatch’s Waterproof Hair Loss Concealer creates the appearance of thicker hair but doesn’t regrow it. Unlike Toppik’s signature product, however, DermMatch doesn’t consist of fibers, but instead comes in a cream form. Nothing against hair fibers, because they produce fabulous results for many men, but some fiber products may fall off way too easily. That’s not a worry with DermMatch’s cream, which you apply all over the scalp with their excellent applicator (it comes with your order). One of the many reasons DermMatch works is its tropical shading process, in which a compound color concealer shades areas where hair is thin. It also blends naturally into existing hair, and the rest of us won’t even know that you’re using it. Another feature of DermMatch’s Hair Loss Concealer we like is that it’s waterproof. Unlike many sprays and powders, it won’t run off when exposed to excessive moisture, and you can swim without worry. It also has natural thickening agents that coat the full length of the hair shaft while helping limp hair to stand and spread out, achieving a naturally “full” look. It even includes emollients that soothe, soften, and moisturize the scalp. DermMatch’s formula also has natural, botanical ingredients that come from mineral and plant sources. With eight blendable shades to choose from, you shouldn’t have any problem matching your natural hair and skin color. DermMatch comes in a disk form that should give you months of use. Thanks to its brush-like applicator, it’s also easy to apply. It goes on “damp,” so give it some time to dry before you put on your clothes and head out the door. DermMatch advises users to not use heavy styling products such as gels, waxes, and pomade after you’ve applied their cream on your scalp. Not all hair concealers are the same or work the same. DermMatch’s cream is unique but effective and an excellent solution for men with thinning hair. If you prefer products that are “natural”, then Every Man Jack has a hair-thickening shampoo for you. Every Man Jack is serious about its commitment to natural, non-harmful products and ingredients. Their 2-in-1 Thickening Shampoo certainly is no exception. Like all of their products, the shampoo contains no parabens, dyes, phthalates, or sodium lauryl sulfate. They even make their shampoo bottles with at least 50% recycled plastic. What their 2-in-1 shampoo does include is soy protein and coconut-derived surfactants, as well as tea tree oil. You’ll find tea tree oil in many hair products, and one of its hair-healthy virtues is that it unclogs hair follicles while nourishing their roots – which helps to promote hair growth. But we don’t give Every Man Jack’s shampoo a two-thumbs-up just because of its eco-friendly attitude and ingredients. No, rather, that’s because the stuff does what it’s supposed to, i.e. help thicken hair while giving it a good overall cleansing. We also include it on our list because it’s suitable for all hair types and provides a gentle cleansing that won’t dry out your hair, even when used daily. It even adds a conditioning element – thus, the 2-in-1 name – in which glycerin and shea butter soften and moisturize hair. Hydrolyzed soy protein – soy protein that’s broken down into smaller amino acid chains for better absorption – helps to strengthen hair but also helps individual strands grow thicker. Meanwhile, tea tree oil helps fight fungus and bacteria that cause dandruff. 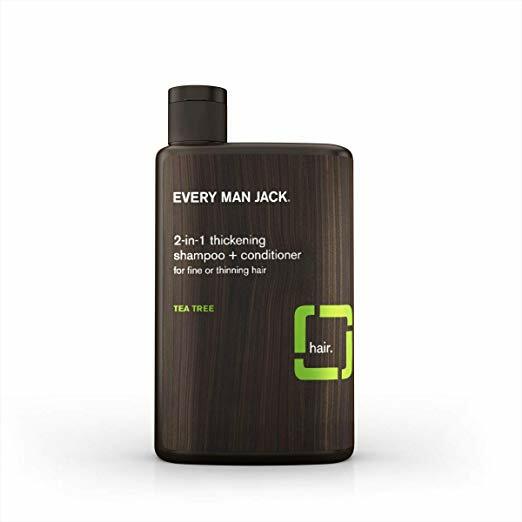 Every Man Jack’s 2-in-1 Thickening Shampoo combines the benefits of a shampoo and conditioner in a product that will help thicken hair. It also has an all-natural list of ingredients that are suitable for anyone who prefers ethically-made grooming products. Hair gel remains one of the most popular men’s grooming products, but that doesn’t mean consumers have a ton of options regarding hair gel for thin hair. Hair gel is all about the hold and, to a slightly lesser degree, the finish, but not so much about making hair thicker. Have no fear, however, because American Crew has you covered with its Firm Hold Styling Gel. It does what a good gel should do – help hold your hair in place without leaving it too stiff and crunchy – but it’s also enriched with natural extracts that help hair look thicker and have more body and shine. You can use American Crew’s Firm Hold on wet or dry hair – unlike with many pomades, clays, and creams – and it won’t flake – unlike many other gels. 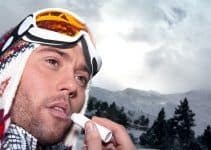 Even if you apply too much of it, you won’t have to worry about brushing flakes off of your shoulders the entire day. Natural extracts such as vitamin B5 help add texture and volume to hair while adding the right amount of shine. The gel also has a low pH to keep hair from drying out. The hold is, well, everything you’d expect from a gel that has Firm Hold in its name. The hold compares favorably to the best clays and styling creams – but one that isn’t too rigid. It’s also water soluble and easy to wash out of your hair (without leaving flakes behind). Any hair product that offers the right amount of hold, without being stiff and crunchy, while also helping hair to look thicker is worthy of attention. How often you shampoo your hair is a matter of personal choice and what type of hair you have – oily, dry, frizzy, etc. It can also depend on the product and its overall strength and harshness. But, no matter your hair type or the product you use, it’s important to keep your thinning hair clean. For one, your strands of hair will clump together when they get dirty and greasy, which creates a lot of gaps in your hair (and over-emphasizes its overall thinness). You want to keep oiliness and greasiness to a minimum. You’ll stimulate and energize your scalp in the process. Speaking of stimulating and energizing the scalp, don’t be afraid to massage your shampoo or other hair-thickening product with some force. A vigorous scrub helps get rid of loose skin particles while exfoliating the scalp. The hair on the sides and back of your head are naturally fuller than in other areas. You may choose to keep the sides and back a bit shorter while letting the thinnest hair – usually on the top – grow fuller and longer. You want to create a blended effect in which the shorter sides fade into longer hair on the top. Whether it’s a short, textured, or “messy” style, it can look great, even if your hair is thinning. The disheveled look of a messy style gives the appearance of having more hair on top. Short, textured styles work well for men who have baldness at the front of their head that goes beyond simply a receding hairline. This type of hairstyle features longer hair on top, while the sides and back are kept short. Meanwhile, the hair is swept forward to create a fuller look to thinning hair. It’s another style that works great for men with a receding hairline. Fades and undercut hairstyles help make the hair on top look thicker and more prominent because of shorter sides and back that add contrast. These styles work well for men who still have some hair in the front. The swept-back pompadour is a nice look for men who are developing a bald patch on the crown of their head. This style creates height at the front of your head as the hair is swept back toward the crown (the longer hair in the front is swept back over the thinning area on top). If there’s one style you should always, always avoid, it’s the comb-over. The comb-over is a blatant example of using longer hair to cover a bald spot and not simply hair that’s thinning. It’s not a good look, fellas. We’ve already mentioned the importance of consistency regarding your hair care routine for thin hair, but it’s worth repeating. Whatever regimen you choose, don’t veer from it – especially if it’s one that produces noticeable results. If you’re using a shampoo formulated for hair loss, then you should also use a conditioner formulated the same way. Hair fibers can give your locks an instant volume boost. Fibers work by binding to hair follicles while creating a fuller look that hides your scalp. They also have an added benefit in that they stay in place until you wash or otherwise wet down your hair. Texture sprays, such as sea salt spray, are excellent for adding volume to hair while also helping to give it some curl and bounce, if you so desire. To apply sea salt spray, dampen your hair to the roots and spray it evenly over the entire scalp. Use your fingers – not a comb or brush – to create your preferred hairstyle. For extra volume and texture, you can also use a hairdryer after you’ve applied the spray, but use a cooler setting on your dryer while keeping it at a greater distance from your hair than you normally would. While there’s some debate as to whether it’s safe to apply texture sprays to your hair’s roots – some say it causes hair to become overly dry – doing so will help create more volume. Gel and wax are go-to styling products for many men, but you may want to re-think your strategy if you have thinning hair. Gels and waxes clump hair follicles together and expose gaps in your scalp; which isn’t much of a worry if you have thick hair. Styling mousse, however, will add texture without weighing down your hair, and it keeps your favorite style in place throughout the day. Or, you can try stying paste, a product that’s somewhere between hair cream and pomade. While products and styling options abound for men with thinning hair, you should also take into account lifestyle factors and the effect they have on overall hair health. Smoking, stress, poor nutrition, and alcohol abuse all can lead to hair loss. Some men’s products used to treat thinning hair may cause follicles to become thicker, while perhaps even spurring hair regrowth, while others create the appearance of thicker hair. We’re not advocating one over the other; instead, we’re interested only in results. The 11 products listed above have delivered on their promises for many men, which is the true bottom line. How they achieve that also is part of the equation, as are other parts of the equation, such as ingredients, ease of application, price, and more. In the end, our goal is to help guide you to achieve solid, proven solutions for thinning hair – as well as easing some of the panics that come with it. All of us lose some of our hair every day, and the process becomes more severe as we age. But other factors, such as genetics, make some men likely to experience thinning hair to a greater degree than others. Fortunately, the men’s grooming market has a plethora of products to treat thinning hair and, if you have hair thin hair that’s causing you unnecessary stress, then you owe it to yourself to try them. How about you? Do you use products for thinning hair? If so, which ones? We always welcome your feedback and hope to hear back from you.